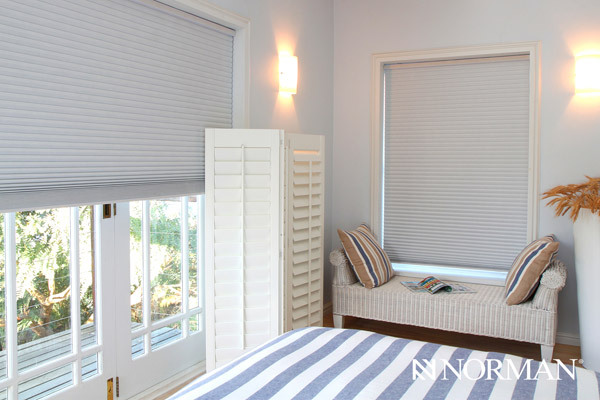 Cellular Shades look fashionable and help insulate your home. They come in a broad spectrum of color options and cell sizes. Cellular Shades help reduce energy costs by way of air pockets that insulate windows from heat or cold. Break-away tassels and cordless features make them child safe. Take advantage of the top-down bottom-up feature when partial privacy is desired, while still enjoying the views from your living area. Consider a black out shade for a home theater room or nursery. With their clean design, they are a great solution for skylights, arches, or on doors. For covering hard to reach windows, motorization pairs well with these shades. A 3/8” Double Cell provides the most insulation and sound absorption. While a 3/8” Single Cell provides a sleek look for small to medium windows, a 3/4” Single Cell is a great option for bigger windows. When searching for window coverings that meet all your design needs while providing energy efficiency, low maintenance, and style, Cellular Shades are the right choice.